Dragon Gate has been in transition since the departure of CIMA,T-Hawk, El Lindamann and Takehiro Yamamura to OWE in Shanghai, with CIMA operating as President of Dragon Gate International, later becoming known as Stronghearts in a sort of invasion of Wrestle-1. The new operating company of Dragon Gate itself would become Dragon Gate Entertainment. There was no dual presence at the DGI press conference, to me it’s signifies the backstage turmoil since YAMATO defended the Open the Dream Gate against T-Hawk, the old company moved things quickly to prepare for this split. And from King of Gate to Kobe World, things moved rather quickly in Dragon Gate, Masato Yoshino would win the tournament on a Saturday in May and challenge and defeat Masaaki Mochizuki for the Open the Dream Gate a day after, surely a better stage and build could have been made. But this wasn’t the only hastily rushed through angle in this time, the feud between ANTIAS and Over Generation that culminated in a Loser’s Disband Match, while needed and the match itself was decent, the angle was rushed through to prepare Dragon Gate Entertainment for post-Kobe World Festival. It wanted all it’s pawns in place so to speak and understandable so, but everything just came at a fast speed. But Dragon Gate itself was born out of change, or split, when Ultimo Dragon took the naming rights and trademarks in 2004. Toryumon Japan and it’s various incarnations ran from 99 to 04, and was the promotion where students of Ultimo Dragon would hone their craft, the likes of CIMA, Don Fuji, Dragon Kid and Susumu Yokosuka. Don Fuji and Dragon Kid still performing for Dragon Gate since graduating from the first class of Toryumon students. Ultimo Dragon still holds shows under the Toryumon banner in Mexico, and continued to teach students long after the closure of Toryumon Japan, with Kazuchika Okada and Taiji Ishimori being two of his former students. Those that had graduated and had been wrestling in Japan under the Toryumon banner and officials formed Dragon Gate after Ultimo Dragon had left. The name Dragon Gate itself is linked to Toryumon, which is said to mean Fighting Dragon Gate, the style of wrestling that is seen in the DG ring is heavily based on the style that those from the Toryumon Gym had learned. 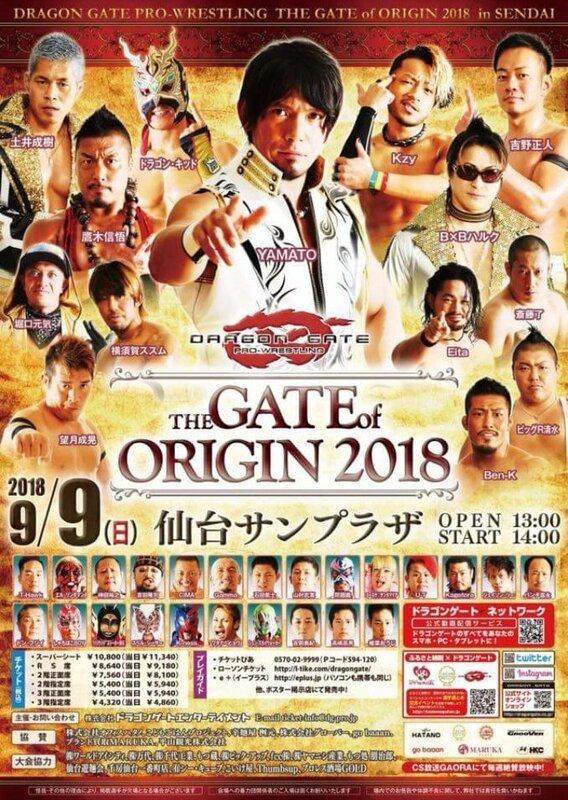 And just as change had been in the air in 2004, change is in the air in 2018, things are settling down as we enter into a new era for Dragon Gate, a company incredibly proud of its own history, with its own style head toward Sendai for a new big event, the first under the name of The Gate of Origin. All four titles will be on the line, plus appearances from Sendai Girl’s wrestlers Cassandra Miyagi and Meiko Satomura, headlined by the man that DGE put the Open the Dream Gate title on to steer them through these turbulent months, Masato Yoshino, who faces the challenge of Takashi Yoshida. ~ The King of DDT reached its conclusion, Daisuke Sasaki winning the tournament, defeating stablemate Tetsuya Endo in the final. This is the third successive year a DAMNATION member has won the tournament with Tetsuya Endo and Shuji Ishikawa winning the 2016, 2017 editions. Sasaki will face the KO-D Openweight Champion at RYOGOKU PETER PAN 2018. Jun Kasai announced on the show that he has signed a contract with DDT and from September 4th he’ll be active with the company. It’ll unlikely affect his FREEDOMS participation. ~ The next challenger for GHC Heavyweight Champion, Takashi Sugiura is Masa Kitamiya. Noah have also announced that Global Junior League will be held in October. This is only the 3rd time the tournament has been run, signifying the great run the company has been having this year. ~ Koji Iwamoto defeated Atsushi Aoki for the World Junior Heavyweight Championship at AJPW show in Chiba yesterday, while Zeus successfully defended the Triple Crown against Shuji Ishikawa. ~ After a successful defence of the BJW Deathmatch Championship against Yuko Miyamoto, Masashi Takeda called out Ryuji Ito. The match for the title will take place in September 16th. ~ New Japan have announced the cards for the main Destruction shows.